Civic Bistro serves up Greek-inspired fare. 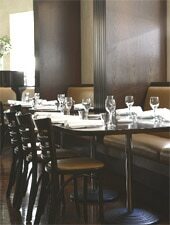 : Civic Bistro offers lunch and dinner in the Civic Hotel. Dishes include shared snacks (calamari, buffalo wings, chicken souvlaki sliders), salads, Greek-style yeeros and mains such as moussaka, chicken schnitzel and a pulled lamb burger.